Has anybody experimented with Chia Seeds? I've tried one recipe for a Chia Fresca drink, but I don't think the directions were correct. What's your favorite recipe for a Chia Seeds drink? What's your favorite whole foods dish to add Chia Seeds to? I like em, too. Not a lot... half a serving a day. I think they taste good, so I just soak them for a few minutes & drink down. I soak a few teaspoons of seed in a 50/50 mix of filtered water and coconut water. After sitting overnight, the seeds create a gel and end up suspended in the liquid. I find that it helps keep things "regular" in the context of a meat-heavy diet. @Kirik - I don't think it's a comfort zone thing, or an elitist type attitude as you seem to suggest. I personally just feel there are myriad other options that would have less negatives and be more nutritionally complete. I'm not saying avoid them like the plague, which is why I simultaneously offered a personal experience recipe. ..."energizing properties. Then when I read on, they boast to aid digestion, boost endurance and hydration, and offer quicker regeneration of muscle tissue..." My personal policy is to avoid any food which is advertised using these kinds of claims. Thanks! I don't often drink smoothies although when I do I think chia seeds would be a great addition. I'll sprinkle some on steamed veggies next time I cook them. That sounds good! Nice! I like the thoughtful response. I can't help but wonder if the same hunter-gatherer who nailed the peccary with a spear would likely nail your well fed cat too? I put them on steamed veggies sometimes and other times I add them into my green smoothies. These guys here are often very interested in feeling as if they are "on top" of things and can get defensive if you go outside their comfort zones or outside what they've been told is "acceptable." It's not a bad or good thing, and I'm not criticizing anyone. I certainly hope to be totally in control of every aspect of everything, just as so many others do. Anyway, enjoy them and go for it. I don't know any great thing to do with them other than add them to stuff that I already have made up. Is there any particular reason you want to add them? I mistakenly bought into the hype a while back. Eat whole, clean foods. You don't need them. As far as an answer to your question, I put some in a jar of fresh coconut water and added some lime. Let sit for a while in the fridge. Not too bad. EDIT: It just so happens that someone at my office is selling packs of Chia Seeds as a weight loss supplement. I thought the timing was rather funny. Anywho, if that isn't a sign, not sure what is. I make chia fresca all summer long. It's really good! I just put some lemon and stevia in filtered water then add some seeds and let it sit overnight. Sometimes I put more, sometimes less. I don't think it really matters. Just adds some body to the drink which is nice. I don't think as highly of chia (or any other seeds) as I once did but I think they are fine in moderation. They make a great pudding with cream or coconut milk and some cinnamon and stevia. You can also grind the seeds and use the flour in baking. Feed them to the birds. Then feed the birds to the cat. The birds get to eat their natural diet, my cat gets to eat his natural diet, and my gut is spared damage from the chia seeds. It is a win-win situation. You'll also note that the poor peasants stuck with the chia seeds did as poor peasants everywhere did...they ground the seeds, they soaked the seeds, they fermented the seeds...then, after way too much work, they could make it into something edible. Meanwhile, out in the forest, some hunter-gatherer nailed a pecary with a spear and had an instant meal. mix with a small amount of milk and cacao powder. delicious chia pudding. google up some other chia pudding recipes - thats my preferred way. I like them. I think they're tasty, have an acceptable carb load, and the fat content makes for a good snack. I haven't found any compelling evidence that says they're detrimental. Maybe they cause GI distress for some people, but I haven't found this to be the case for me personally. I say if you're curious then try it and measure your reaction to them. Put em in a cup of waterand squeeze half a lemon, add some agave if you wish. Let it sit for 15 minutes, stir occasionally...delicious! Recipe from "Born To Run" used by a superathelete tribe in Mexico called "Raramori" AKA "Tarahumara"
Paleo eaters typically avoid eating seeds as they are full of lectins and other toxins. I sometimes grind the seeds and add them to raw puddings, but they absorb a lot of liquid, so I usually just make chia gel by soaking them in water. The best ratio of seeds to water is 6:1, or 1/3 cup chia to 2 cups water. The gel takes about a half hour to thicken. I store it in a glass jar and it stays fresh in the fridge for a couple weeks. While I'm not a fan of ALA, I personally never notice digestive distress from the lectin or phytate content, and I find the insoluble fibre to be beneficial for me, especially since I can't handle all the raw greens. They also help stabilize blood sugar when you eat them with starch, which I appreciate because I feel like I've been poisoned whenever my blood sugar spikes. 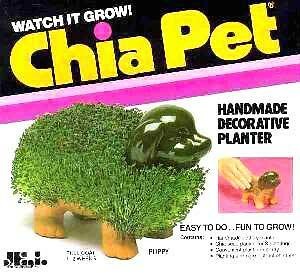 All I can tell you is this: I bought chia seeds on a whim. I had heard some good things about them so I thought I'd give them a try. I can tell you as someone who has some serious stomach problems, as in acid reflux and stomach aches, that these seeds do wonders for your stomach. I assume it's because of the gelling properties of them. I will make them with almond milk and honey for a "yogurt" or I will just mix them with apple juice, let them sit for 10 min and drink. My stomach feels instantly better when I consume them. Not to mention, they taste good! For me, these little seeds are awesome and I would highly suggest giving them a try! The nutritional value of them is just a plus! I don't understand the negative comments I've seen - any "diet" is going to be somewhat couter-productive eventually, however, adding healthy foods to your meals is a good thing. There are tons of toxins in out food, and we've been eating it for decades now. It's not a mystery why there is a weight/health problem in this country - between the no fat, no meat, no carb fad diets everyone has been confused into just eating and hoping it works out. On point though, Chia seeds actually can help detoxify your body - some of the toxins in our bodies are not water soluable, so they bond to our fat stores, thus the body won't release the fat or it will sustain damage. Chia seeds are a way to get those toxins out of the body.